Light produced in the process of spontaneous parametric down conversion. (Illustration credit: NIST). Entanglement, by general consensus of physicists, is the weirdest part of quantum science. To say that two particles, A and B, are entangled means that they are actually two parts of an inseparable quantum thing. An important consequence of this inherent kinship is that measuring a property of A (say, the particle’s polarization) is necessarily to know the corresponding property of B, even if you’re not there with a detector to observe B and even if (as explained below) the existence of that property had no prior fixed value until the moment particle A was detected. To create such entanglement it is generally necessary to generate particles two at a time and to generate them so that they are born with this connected property. The most basic step in measuring such a system is to measure and detect both particles and to do so efficiently. So it had better be the case that if one detector registers a particle, the other detector should collect and register the other particle. Because we know that if we see one particle, the other must exist, we say that the detection of one particle “heralds” the existence of the other, just as medieval heralds, with their banners and bugles, signified the arrival of a king. Although in this case, because with these particles born in twos, one photon is no more regal than the other, so we can equally well say that one photon heralds the other and vice versa. But as in the case of a king, in real life even though the herald announces the king he may be waylaid and never appear. An experiment conducted at the Joint Quantum Institute (*) establishes a new record for heralding efficiency for a pair of entangled photons (particles of light). The JQI work is published in the May 15 issue of the journal Optics Letters (see below). What happens is this: about 84% of the time the researchers observe photon A they also observe photon B just where it should be, and vice versa. The JQI detection scheme will be useful for a number of reasons: it should help experiments to tighten remaining loopholes over the fundamental sway of quantum reality; it shows that sources of single heralded photons can achieve a certain level of reliability; and that might be a critical ingredient in producing a source of random numbers in a way that guarantees that any nefarious attempts to “load the dice” are impossible. The JQI experiment demonstrates a photon source which could allow one to get to the heart of counter-intuitive nature of quantum reality by looking at indeterminacy. In common experience a coin facing up has a definite value: it is a head or a tail. Even if you don’t look at the coin you trust that it must be a head or tail. In quantum experience the situation is more unsettling: material properties of things do not exist until they are measured. Until you “look” (measure the particular property) at the coin, as it were, it has no fixed face up. What this indeterminacy means is that until it is observed an object has no definite value for that property. So the property in question, whether it is position, velocity, charge, polarization, or some other attribute, cannot even be said to exist. Instead the object is said to be in a superposition of states and its physical attributes can potentially take on a variety of values. When describing the existence of this particle, we can do no more than specify a set of probabilities that the object’s properties have certain values. At the moment measurement occurs the object undergoes a “collapse of probability.” The probability estimates in play just before measurement become superfluous. The property being measured---the polarization of a photon, say---has assumed a definite value, horizontal or vertical in this case. Describing reality in terms of indeterminacy and probability bothered Albert Einstein. Surely, he said, a particle’s property exists before it is measured and a theory more complete than quantum mechanics would include the existence of those properties before they were measured. Those properties before measurement must be contained in some variables hidden from the standard quantum mechanical representation. The search for those “hidden variables” pertaining to the existence of things occupied a lot of Einstein’s time in the latter part of his life, and has been a topic of concern with physicists ever since. In the 1960s John Bell proposed a number of experiments designed to test the validity of things like entanglement and indeterminacy. So far all such tests have supported the validity of quantum indeterminacy and have discouraged the idea of any hidden variables. But for some skeptics, loopholes remain, and they argue that the reality of entanglement has not yet been adequately demonstrated. One reason for this is the difficulty in measuring properties of two or more (supposedly entangled) objects with sufficient efficiency. The relatively poor measurement efficiency, resulting in the failure to detect one or the other of the pair of entangled photons, allowed skeptics to assert that the measured sample of pairs did not constitute a good enough representation of the overall set of objects to be able to say something definitive about entanglement. The experiment effort in Alan Migdall’s JQI lab specifically targets the efficiency of the heralding process. To start, the researchers send a beam of ultraviolet photons into a special crystal where, at a rate of about one per billion, a UV photon is turned into a pair of entangled photons. This process is called spontaneous parametric down-conversion (PDC). 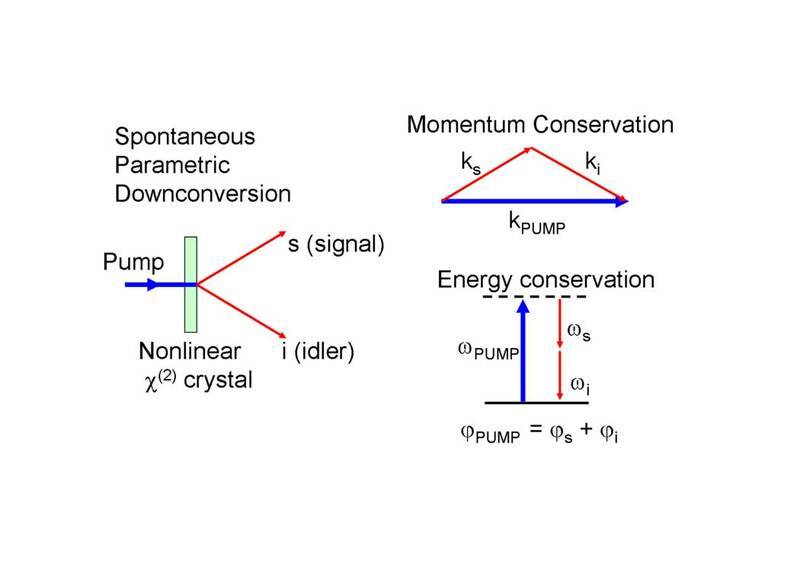 The laws of physics dictate that the momentum and energy of the incoming photon (from the pump beam) should be split between the daughter photons (one is called the “signal” and the other the “idler”). 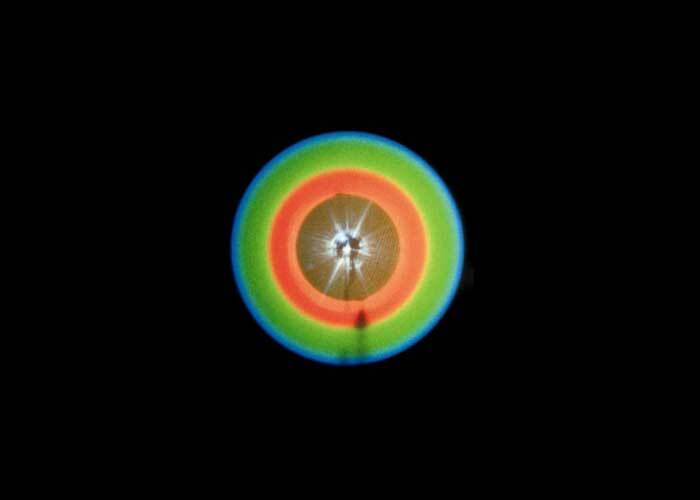 In this picture omega is the frequency of the respective photon and is proportional to its energy. The daughters might, for instance, be a green photon plus a near-infrared photon, or two red photons, or any other combination of colors so long as the sum of the energies of the photons adds up the energy of the pump photon. Each of the two photons makes its way through a lens and into a fiber so narrow that only a single mode can propagate. That is, if we think of the light not as a particle (photon) but as a bundle of electric and magnetic fields, the lateral profile of the ray will have a simple Gaussian shape. This kind of fiber, aligned to exacting standards, ensures that photons of a very specific energy and direction will be channeled into a photodetector where its presence and time of arrival can be determined. “In effect the observation of photon A brings photon B into existence,” says Alan Migdall, “at least if these are true entangled photons.” This entanglement between the existence of a photon and no photon (or vacuum) is not what is usually considered to be entanglement but it is nonetheless. The aim of this JQI experiment is not itself to test the Bell criteria for entanglement (as it turns out the polarizations of photons A and B are known be forehand), but rather to optimize the process of heralding---the ability to say that if A is here then B is there. For some theories a heralding efficiency must at least 82% if entanglement loopholes are to be closed. The JQI physicists have now exceeded this yardstick. They typically observe about 50,000 signal photons (photon A) per second in their detector. And when this happens about 84% of the time a photon is seen in detector B. And simultaneously, when the roles of the two detectors are reversed a comparable percentage is registered. This is the highest symmetric heralding efficiency for a single-mode fiber yet seen in any experiment. Migdall says that because of the random nature of observing a photon with an appropriately prepared polarization state, the measurement of a heralded photon can be turned into a number that is truly random and guaranteed to be free of tampering. Such random numbers can, in turn, be used in various schemes to encrypt messages that can never be cracked. (*)The Joint Quantum Institute is operated jointly by the National Institute of Standards and Technology in Gaithersburg, MD and the University of Maryland in College Park.